​Wednesday we went to Golden on a scenic byway to see the sites and Buffalo Bills grave. Afterward, we drove to Boulder and toured the Celestial Seasonings factory, which was fascinating. Finally, we walked the mall at Cherry Creek and went to Niemen Marcus. The first small bag we looked at cost more than $1,200, so Linda was in her element. It occurs to me that this was an appropriate ending to our family history trip and analogous to the very purpose for which we went to Denver, Colorado in the first place. 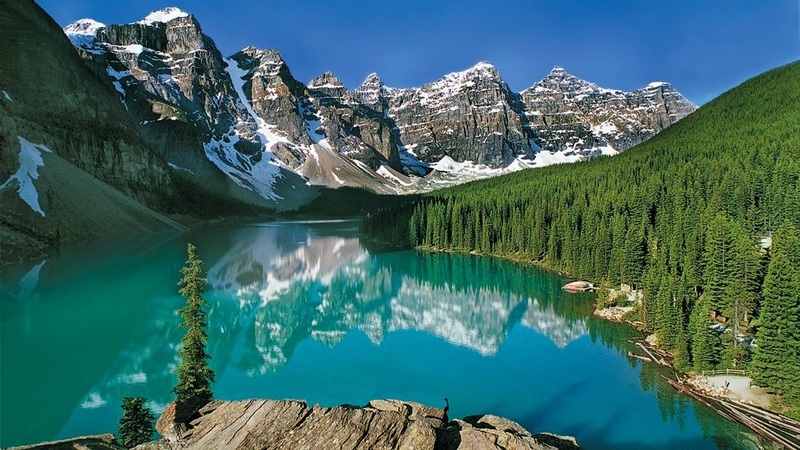 The beautiful roads we drove and the spectacular cities we saw nestled in the Rocky Mountains around Denver are like unto the wealth of treasure that is available to us in the form of family history treasures that await our finding. They sit and await our realization that the most beautiful and important relationships may be those at our fingertips, which promise to exceed our grandest expectations. After breakfast on Tuesday we went to the Denver mint where Gma loaded up. Or at least that's what she said she was going to do. The instructions were clear and the warnings precise. Get there on time or you would not be admitted to the tour. So we left early and after parking just below the capital building, we went to the capital steps to find the mile high step and took pictures. ​The highlight of our trip occurred next. We drove out to Arvada (map) to visit Dale and Lydia. They live in a beautiful little spot with lakes and golf courses and lush trees and forest around them. Dale greeted us and invited us in to introduce us to his wife Lydia. We sat in their comfortable living room and visited. Dale was married to his first wife for only a couple years. He and Lydia have been married for 30 years. It occurs to me that our families are made up of people who can change our lives and add so much to the world in which we live. Lydia is one of those kind of people. She is fun and talkative. She is kind and welcoming, and we felt a natural affinity for her. Dale said that his mother died giving birth to his little sister. Linda asked Dale if he had in memories of his mother, Thelma. He said he had one. He remembered her sitting at the makeup counter putting on her makeup. That was the day she went to the hospital to deliver her baby. Lydia's father is living with them currently. We were looking at many pictures down memory lane hanging in the hallway and said hello to him but unfortunately failed to take time to visit with him at all. Then just before dinner, Lydia invited us to sit around the table in their dining room. She served us French-dip sandwiches, salads, and drinks. And we continued visiting until late. She served delicious fruit cups and cakes that looked like they came from Kneaders. Lydia confided in us that she wants to begin a blog for people faced with the challenge of handling elderly care and dealing with some life decisions that we often fail to prepare for. She and Dale have become friends we hope to keep in touch with for many years to come. We travel through life with an opportunity to reach out to others and influence their lives for good, but in reality our efforts only serve to bless our world more abundantly. This doesn't just affect your acquaintances, friends, and immediate family. This truth goes on to bless many others—your extended family, people who witness your cause, and the whole world eventually are edified—that's what dads do. Thank you Elwood, Gaye, Milton and Dale. We are better because we know you. ​First thing Monday, we went to Crown Hill Mortuary (map), where Gay is buried. We took pictures of his headstone and other family member's in that cemetery. We bought some flowers and secured vases for Gay and his parents. Elaine has a spot next To him. We met some nice people who were visiting a grave of their family member and offered to share some water for the flowers we brought for Milton and Thelma (Gma's sister). Next, we went to Fairmount cemetery to find the Smith graves. Jessie is Elaine's mother, and we found her stone and others in the family, including her parents and husband. Elaine wanted to show us where she grew up, so we drove down to southeast Denver to Franklin street where Elaine spent her childhood. Her father built their home and the home next door, both of which they lived in for a time. The former they stayed in for about a year, while they lived in the latter for 20 years or so. We met a neighbor woman there named Mary Lou Smith. She talked and visited with us. and went back in the home to find a special picture of the original owners of her home. She brought her husband out to see us and told us the original Chipotle was just down the road, where we had lunch naturally. We drove around Denver University and took pictures, then continued to Washington park. Both the are located near Elaine's home. Elaine recalls that her father wanted her to walk to the Denver University, rather than going to CU (Colorado University was where Elaine wanted to go, supposedly). It occurs to me that one decision can alter lives path now and for years to come for each one of us and our entire posterity. She met Gay at DU. We also drove around Washington Park and went to the church where Gay and Elaine were married. Finally we went to the Denver Temple and took pictures. It was closed but the gates were open so we went around the grounds and took pictures. We visited with the security guard there and came back to our apartment. They moved us into a non-smoking room, which was much better. 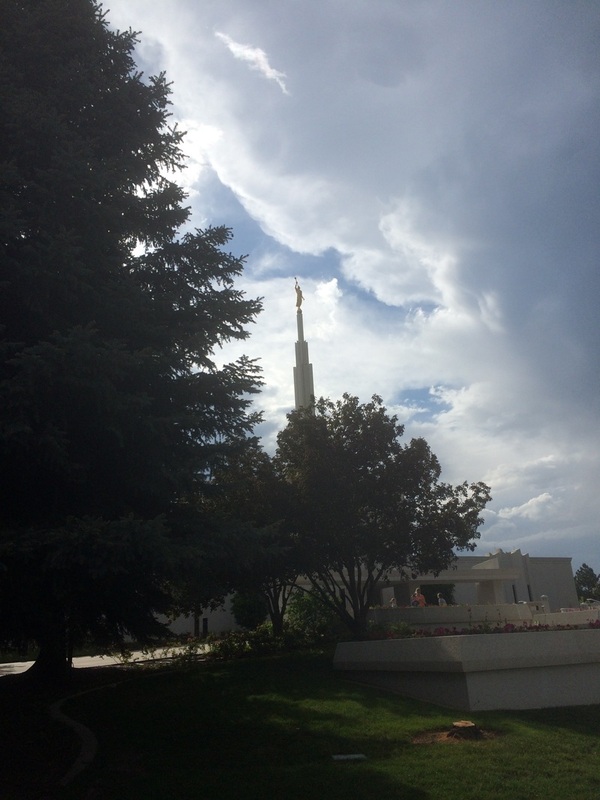 ​Finally we went to the Denver Temple and took pictures. It was closed, but the gates were open. So we went around the grounds and took pictures. We visited with the security guard there and came back to our apartment. They moved us into a non-smoking room, which was much better. 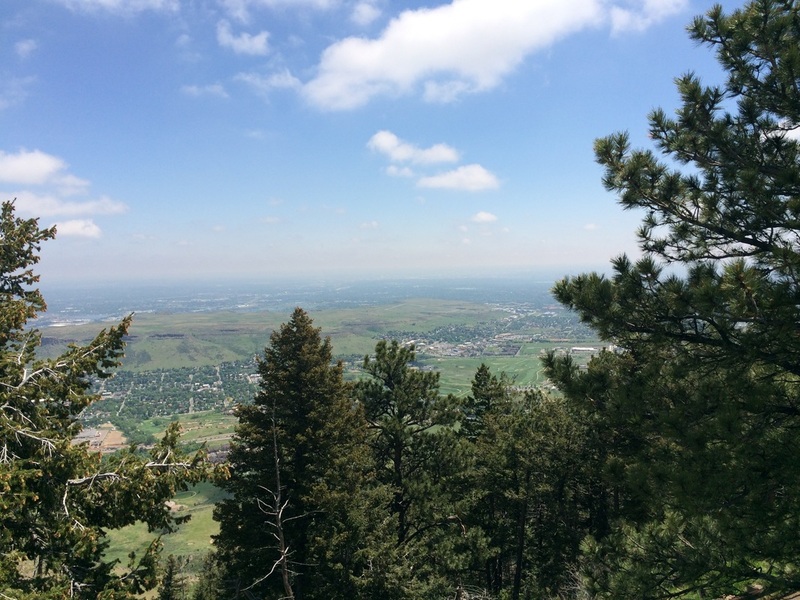 We have talked for some time about the goal of taking Elaine to Denver to let her show us the area of her youth and reconnect with her only remaining family here on earth. We wanted to see where she lived, went to school, was married, and the homes her father built. We had tentatively planned it for the summer, but all of a sudden memorial day was the next weekend, and we didn't have plans, so we decided to take a trip to Denver to see Gay and Thelma's graves and let Gma show us her stomping grounds as a child. Flights were secured, a hotel room and a rental car reserved. ​We flew into the Denver International Airport (map), arriving late Sunday night. We collected our car and found the hotel and room. It was a Quality Inn, but they only had a smoking room available. We were tired, and they promised they would move us to a non-smoking room in the morning, so we stayed. The innkeeper said they would give us some spray to alleviate the smell, but it really didn't help. Somehow we made it through the night. In the morning, we had a full, hot breakfast and started off for the day. Our family history is perhaps the most significant hidden treasure in our lives. Does that sound like an exaggeration? Perhaps it appears that way, but consider for a moment where we get our happiness, and who it is that brings meaning to our lives...family. Why do we work all day, everyday so we can come home to enjoy a few minutes with those we love?...family. Why do we save pictures, and notes and celebrate birthdays, anniversaries, and other special occasions?... family. How could we not extend those moments out to enjoy now and for eternity. Family is our most priceless treasure. 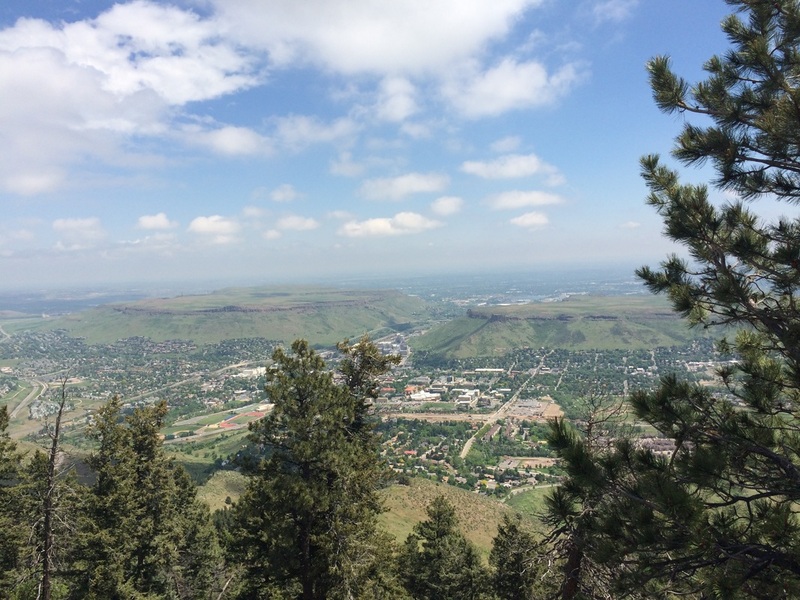 This daily log and pictures capture the trip to Denver with Elaine to fulfill a bucket list item of returning home to reconnect with family, friends, and memories.